Yeti Airlines Aircraft. File picture. Pokhara—An Yeti Airlines jet stream aircraft escaped the big accident as it skidded off the run way in Pokhara on Sunday. The 9N AHU aircraft took off from Kathmandu and was just landed at Pokhara Airport but skied off when it was heading to Parking lot at around 3 pm. 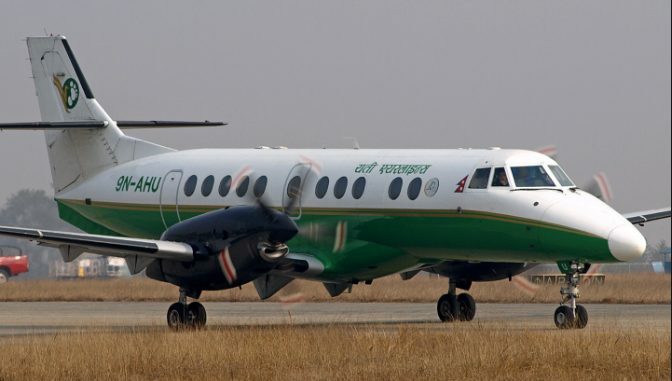 The aircraft reportedly suffred hydrolic failure and sliped 20 meter away to the grassy ground, informed Pokhara Airport Chief Bhola Prasad Guragain. All the 30 passengers and crew members on board remained safe during the accident. The rescue team with fire engine had reached near aircraft. A technical team has been called to Pokhara to observe the aircraft. Other flights are not affected due to the accident.